The AWRI has been successful in achieving funding for a new project as part of the Food Agility CRC. This collaborative project with Queensland University of Technology (QUT) and National Australia Bank (NAB) will bring together traditional agricultural financial risk assessment and natural capital accounting to gain new insights into the value of sustainability investments and practices. Preliminary models will be developed and potential sustainability indicators will be identified. The project will lead to improved assessment of business sustainability, decreased investment decision risk and improved access to finance by growers. Phase one of the project will be the identification by the QUT research team of potential financial parameters from the natural capital literature and through interviews with NAB frontline bankers, agronomists and growers. This will be followed by collection of financial and environmental data including energy, water and fertiliser use, from a pilot group of growers through the Entwine survey. Preliminary modelling will be focused on generating insights and patterns of related metrics to inform the broader data analytics and on which to base grower case studies that demonstrate improved economic returns achieved using sustainable practices and investments. Deeper analysis of the larger Entwine dataset will highlight the dependencies of relationships across metrics, identify critical factors in financial decision-making and provide preliminary benchmarking of financial performance. 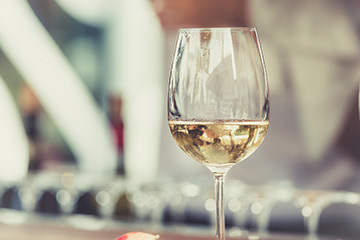 Upon the completion of this research, the AWRI will communicate the project results and discuss future research directions with wine industry stakeholders. For more information about this project, contact Dr Mardi Longbottom on 08 8313 6600 or mardi.longbottom@awri.com.au. Genetic transformation is a foundational technology that enables the comprehensive study of a species. When available, it opens up a multitude of molecular biology tools, such as gene overexpression, gene deletion, incorporation of marker genes and tagging for visualisation or purification. Transformation has been available in Saccharomyces cerevisiae for well over 30 years, with much of the knowledge that has been generated for this species due to the early development of this technique. While, genetic transformation for Brettanomyces bruxellensis was developed recently, it suffered from a very low efficiency that limited the scope of tools that could be developed. 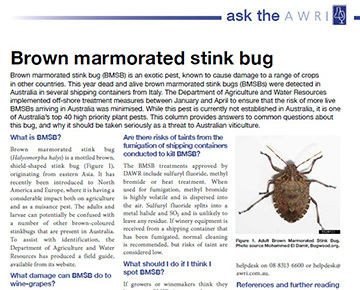 To address these shortcomings, AWRI scientists have developed a new gene transformation protocol for B. bruxellensis. 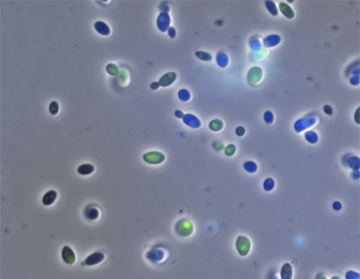 As part of this process constructs have been created which enable Brettanomyces cells to be labelled with either green- or blue- fluorescent proteins. Cells that express these proteins glow when exposed to certain wavelengths of light and this enables the rapid identification and counting of these cells during fermentation. This work has recently been published in FEMS Yeast Research. The full paper is accessible via the AWRI library: Varela, C., Lleixà, J., Curtin, C., Borneman, A. Development of a genetic transformation toolkit for Brettanomyces bruxellensis. FEMS Yeast Res. 18(7): 1-6; 2018. AWRI scientists based within Metabolomics South Australia have just released a piece of code (known as MStractor, written in the R programming language) on the software development and sharing platform GitHub. The software is designed to help researchers process data from non-targeted liquid chromatography mass spectrometry (LC-MS) experiments and can be downloaded for free by any interested party from https://github.com/MetabolomicsSA/MStractor. This is one example of a relatively new area for AWRI scientists to be involved in – sharing code that has been written in-house with the broader research community via an open access licence. Metabolomics SA is the South Australian node for Metabolomics Australia – a nationwide, government-funded initiative established to enable the development of, and access to, state-of-the-art metabolomic analysis, through investment in infrastructure, method development, collaboration and integration. Metabolomics Australia acknowledges funding and leadership from Bioplatforms Australia under the National Collaborative Research Infrastructure Strategy. The term metabolomics refers to the comprehensive analysis of the complete set of all low molecular weight metabolites that exist within a biological system such as grape juice or wine. For more information about Metabolomics SA, contact the team on metabolomics@awri.com.au. Since 2012 the AWRI’s helpdesk team has published a monthly ‘Ask the AWRI’ column in Australian & New Zealand Grapegrower and Winemaker. Each column focuses on a technical issue relevant to growers or winemakers and provides practical information in a Q&A format. The full archive of Ask the AWRI columns is now available on the AWRI website, with permission from the publisher, Winetitles. So, if you would like to know more about carbonic maceration, spray drift, taints in wine or countless other topics, check out the collection now. As spring gets underway, there are a number of workshops and seminars coming up in wine regions across Australia. The AWRI’s ‘Addressing regional challenges’ workshop will be held in Mudgee, Orange and Canberra from 9 to 11 October. These workshops present regional-specific data and include information on the latest technologies and process options for grapegrowing and winemaking, with specific topics selected by each regional association. AWRI seminars will be held in Western Australia (Mt Barker, Pemberton, Margaret River and Swan Valley) from 6 to 9 November and in Victoria (Gippsland, Mornington Peninsula, Geelong and Yarra Valley) from 27 to 30 November. These will feature a selection of presentations covering the latest in viticulture and wine research. Workshops on spray application are also planned for Stanthorpe, Orange and Canberra from 13 to 16 November. Visit the AWRI events calendar now for a full list of upcoming events or contact the events team on events@awri.com.au or 08 8313 6600 for more information. 2023 Kontoudakis, N., Mierczynska-Vasilev, A., Guo, A., Smith, P.A., Scollary, G.R., Wilkes, E.N., Clark, A.C. Removal of sulfur-bound copper from white wine by membrane filtration. Aust. J. Grape Wine Res. DOI: 10.1111/ajgw.12360: 1-9; 2018. 2024 Varela, C., Lleixà, J., Curtin, C., Borneman, A. Development of a genetic transformation toolkit for Brettanomyces bruxellensis. FEMS Yeast Res. 18 (7): 1-6; 2018. 2025 Hendriks, H.F.J., Stockley, C.S., Calame, W. The 2015 Dutch food-based dietary guidelines for alcohol consumption – a critical review. J. Nutr. Health Sci. 5 (3): 1-9; 2018. 2026 Hixson, J., Grebneva, Y., Glameyer, N., Vollmern K. Black, C., Krstic, M., Herderich, M. Shedding light on the modulation of key Riesling wine aroma compounds in a changing climate. Siegmund, B., Leitner, E. (eds.) Flavour Science: Proceedings of the XV Weurman Flavour Research Symposium, 18-22 September, 2017, Graz University of Technology, Austria. Graz, Austria; Verlag der Technischen Universität Graz. 19-24; 2018. 2027 Parker, M., Barker, A., Pearson, W., Hayasaka, Y., Hixson, J., Francis, L. Flavour release from wine glycosides during tasting. Siegmund, B., Leitner, E. (eds.) Flavour Science: Proceedings of the XV Weurman Flavour Research Symposium, 18-22 September, 2017, Graz University of Technology, Austria. Graz, Austria; Verlag der Technischen Universität Graz. 31-36; 2018. 2029 Siebert, T.E., Barter, S.R., Pearson, W., de Barros Lopes, M.A., Darriet, P., Herderich, M.J., Francis, I.L. Why does this wine smell like apricots? Siegmund, B., Leitner, E. (eds.) Flavour Science: Proceedings of the XV Weurman Flavour Research Symposium, 18-22 September, 2017, Graz University of Technology, Austria. Graz, Austria; Verlag der Technischen Universität Graz. 245-248; 2018. 2030 Stockley, C.S. Ask the AWRI: Alcohol during pregnancy and breastfeeding. Aust. N.Z. Grapegrower Winemaker (655): 83-84; 2018.